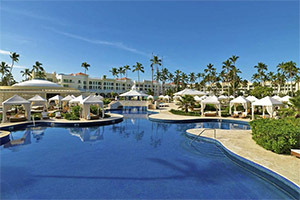 Located directly across from Bávaro Beach, this luxury hotel has two freshwater pools, an activity pool, game rooms, conference rooms, shops, a library, club house, spa and tennis courts.There are six restaurants at the hotel (four specialty restaurants and two buffet style) offering a wide range of dining choices, a variety of sporting activities and numerous entertainment and relaxation options for an unforgettable vacation. It is located directly across from Bávaro Beach, a popular tourist spot offering many sporting activities. Punta Cana Airport is just 30 minutes away. The hotel has a buffet restaurant, four themed restaurants and a beachfront restaurant offering a variety of dining choices: from Japanese cuisine prepared on tepanyaki grills to prime rib to shellfish and local fare.